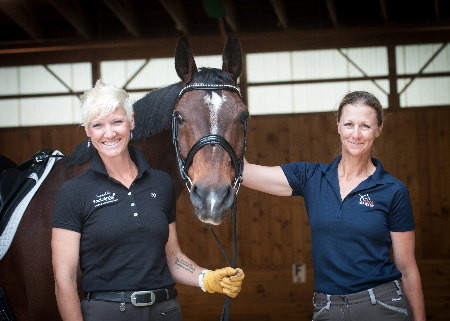 Robyn Hahn (pictured) and Laurie Bauchman are two amateur dressage riders from North Carolina who received grants from The Dressage Foundation to further their education in dressage. Robin received her grant in 2011 and Laurie received her grant in 2009. They answered several questions below to share how the grants have continued to make an impact on their training and education. They also reflect back on the experience now that several years have passed. 1. Where do you currently live and ride? 2. When did you receive your TDF grant and how did you use it to train? 3. Why did you apply for funding? I heard about the TDF and grants for AA dressage just a few years prior and became interested because time and money are always short, but there is so much to learn!! 4. What one thing do you remember most from your training? In addition to my daily lessons, I watched Jules ride at least 5 horses each day. What struck me most was how incredibly straight all his horses traveled. 5. What did you learn and how have you applied it to your riding since the training? The concept of shoulder control. Jules' lessons focused on maintaining control of the shoulders, and would be the foundation for all other work that week. 6. What goals have you accomplished since the TDF-supported training and what are your current riding goals? My goal was to solidify the basics needed for a successful Second Level. That season Bravo and I finished USDF All Breeds Champion at Second Level (Hungarian Horse Association of America), 9th place overall Dover Medal year end awards (National), and 13th place USDF Second Level Adult Amateur Year End Awards (National). Currently we are working on the basics needed for Third and Fourth levels, and have had 2 very successful outings this season at Third level. 7. 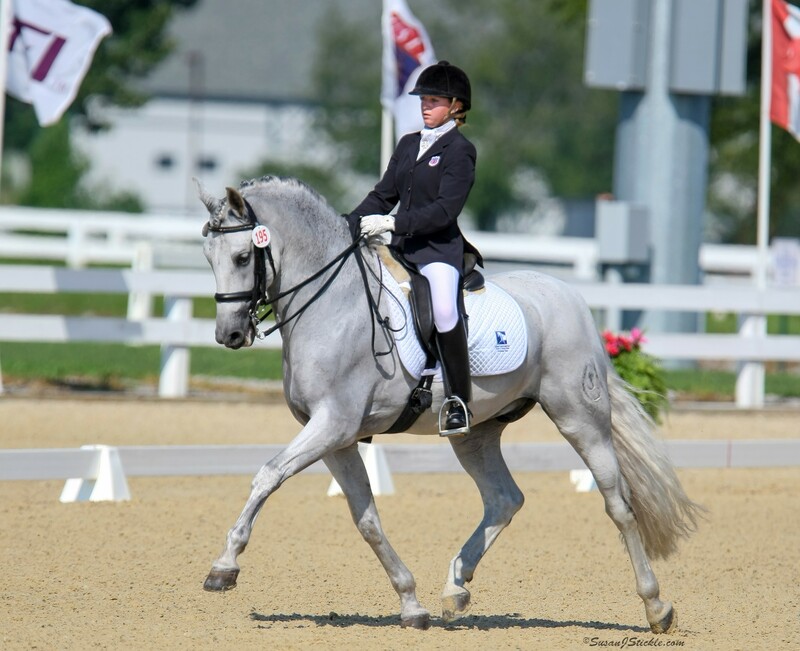 Dressage has never been the kind of sport that has many opportunities for financial gain or sponsorships, especially for amateurs. As an amateur rider, what did it mean to you to receive financial support to further your training and education? I NEVER could have afforded to take a week off of work and focus solely on training, MUCH LESS be able to afford training with someone of the calibre of Jules Nyssen! 8. What was the best part of receiving the grant? In addition to all the things I've already mentioned, I've maintained contact with Jules and feel like I can go to him for training advice. I'm not sure there's a "best" part--the entire opportunity was priceless. 9. What advice do you have for other amateurs who are seeking to advance their skills and knowledge? Apply for every scholarship for which you are qualified (the NCDCTA also has a lucrative scholarship program), audit clinics, scribe at local and USDF shows, etc. as these are all valuable tools for learning! Since being cognizant of TDF I have noticed that the Gifted scholarship for Region 1 has gone unfunded several times! You can't win money if you don't apply! 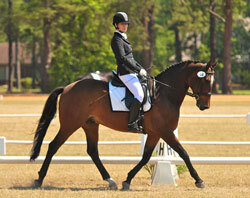 I live in Raleigh and train at Windcroft farm with Becky Blikslager. I have also been taking lessons with Kay Meredith, who comes regularly to work with Becky. I spent one week training with Scott Hassler at Hassler Dressage in Maryland in 2009. My horse was six years old and competing at Second Level at the time. I had ridden with Scott in a clinic and it was really helpful. I wanted to spend more time working with him but it was not a possibility for me without the financial assistance of the scholarship. Scott helped me to be braver about riding through resistances. When my horse would get tense or strong I would sometimes back off without realizing it, instead of riding through it. Scott helped me to see that those were the teachable moments for the horse and I learned to ride more assertively during those times. One of the things we worked on heavily was trying to increase my horse's adjustability within the gaits. I needed to show more of a difference between his collected and extended gaits. There was a lot of forward-and-back riding in my training with Scott and I have tried to keep that a part of my daily work. My horse, William, was the NCDCTA AA Horse of the Year at Second Level and the following year, at Third. He also received year-end awards for the USDF and KWPN at those levels. This year, we made our debut at Fourth with a score of 69%. The TDF scholarship was instrumental in helping me to achieve all of these goals. My riding is funded by my salary as a public school teacher, so it is always a challenge to deal with the financial side of our sport. 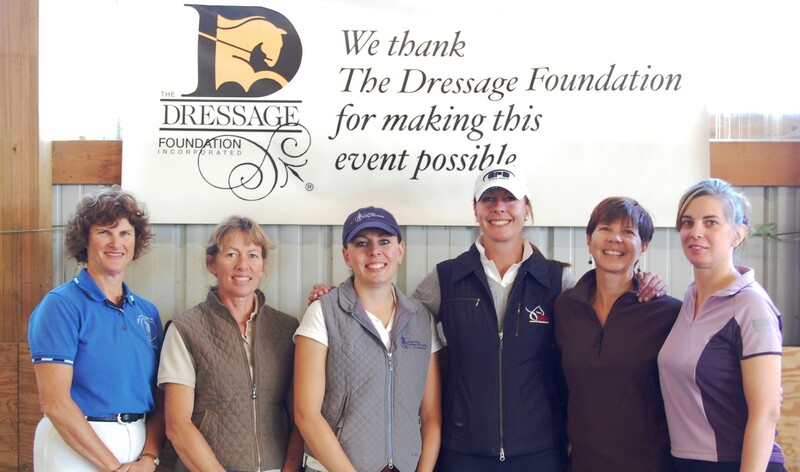 I would never have been able to go spend the week I did with Scott without this assistance from The Dressage Foundation. I now have a one-year-old son so life has only gotten busier and more expensive, which makes me even more grateful that I was able to have such an extraordinary week with my horse. I have been able to ride with some great clinicians over the years but it was a totally different experience to be able to go for a week and immerse myself in a training program. I was able to stay onsite and being physically away from the responsibilities of home and work made it possible to really focus on riding. I wanted to go to a top facility where I would be exposed to the very best. Not only did I receive great instruction, but I was able to watch Scott, Suzanne Hassler, and J.J. Tate ride and train every day. When I returned, my instructor commented that my position had improved and I know that part of that sharing the arena with those other riders. It made me sit up a little straighter when I would ride past the mirrors! We are all so busy and money is always in short supply. Most of us only have time to ride one horse a day. I try to supplement my time in the saddle by reading and watching whenever I can. I have read some great sports psychology books and many of the USDF recommended books. There are some great websites where you can watch top riders lecturing and teaching. I find this is a really practical way to learn, since these days I rarely can take an entire day to go to a clinic to audit. I think most people are visual learners, so watching good riding can be really helpful. My best advice to other riders is to not let financial constraints stop you from pursuing your dreams. There are always people out there who are willing to help if you are willing to work hard. For information, visit the Carol Lavell Gifted Memorial Fund page.